Discussion in 'Android Tablet Reviews' started by fashionluo, Jun 5, 2016. Running dual operating systems, and switching from one to the other is simple. Screen offers good viewing angles and vibrant colors. 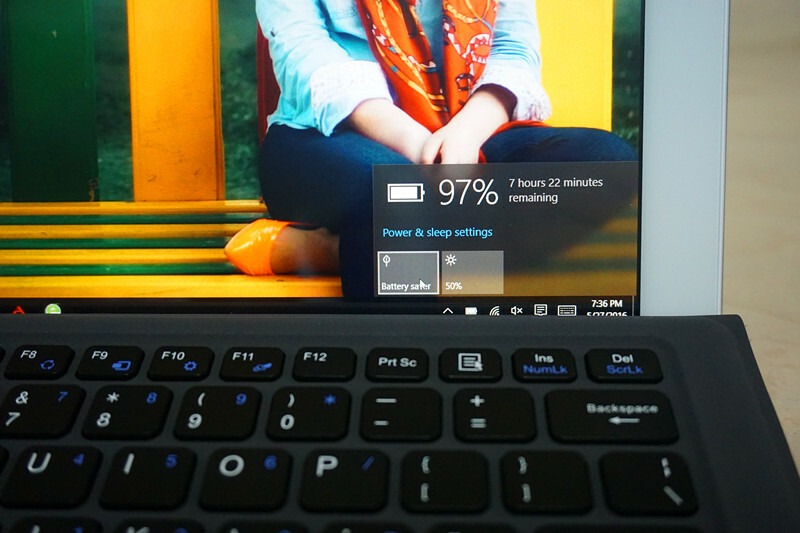 Very little improvement in performance compared to the Bay-trail powered tablets. 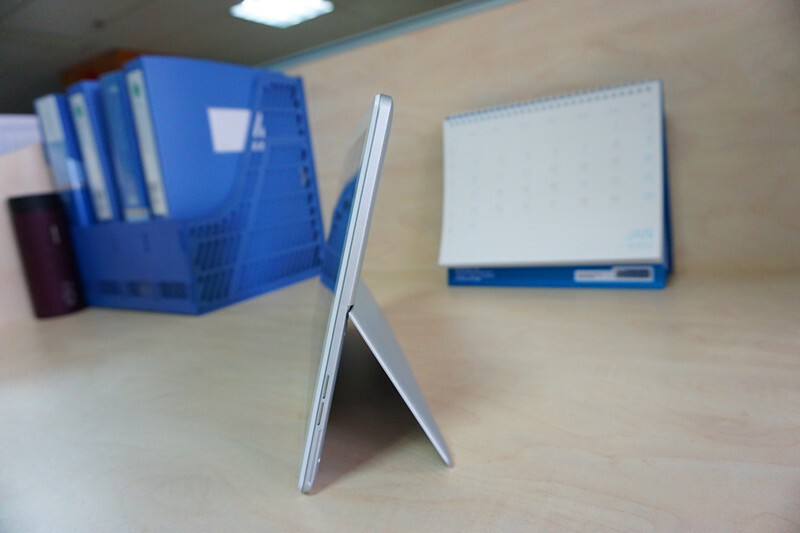 A lot heavier than the Surface 3. 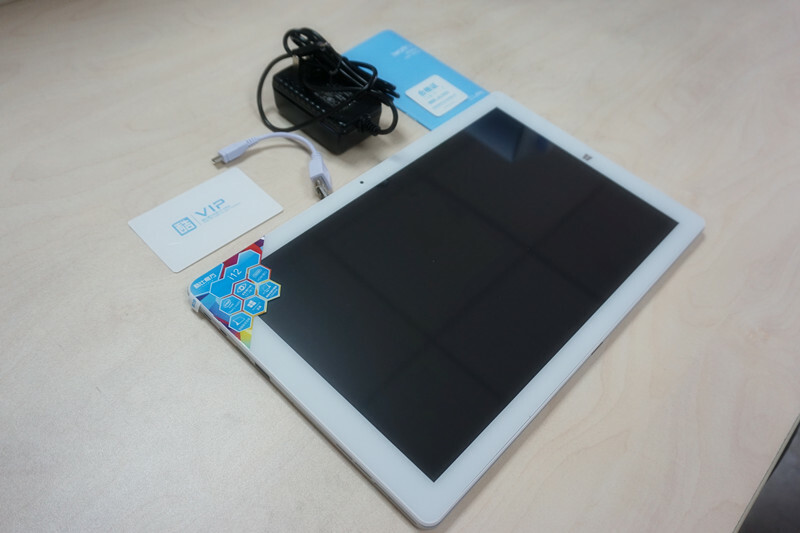 Cube has attracted lots of attentions with their line of affordable 2-in-1 convertible tablets since early 2014. Now they have two lines of convertible tablets: the premium Core-M powered i-series tablets, including the Cube i7, Cube i7 CM, Cube i7 Stylus and Cube i9, and the more affordable Atom-based iWork series, such as the iWork 10, iWork 10 Ultimate, iWork 11 Stylus, and the all new iWork 12. There are some exceptions, though. The Cube i6, i10 are not premium Windows tablets like the i7 and i9, instead, they are Atom based tablets, designed mainly for basic tasks. As confusing as Cube’s product naming is, the all new iWork 12 is definitely Atom-based. With a 12.2-inch screen and a kickstand, it bears a striking resemblance to the more premium Skylake Core M powered Cube i9. Running on an Atom Cherry Trail X5-Z8300 CPU and 64GB eMMc drive, the iWork 12 is more of an entry-level convertible than a powerhouse hybrid. The RMB1,599 ($244) price may seem low compared to similar systems such as the ASUS T100HA, but it is still a tad higher than the price of the iWork 10 Ultimate ($152.4), which rocks the same internal setup. Are the $82 extra bucks a worthy investment for more screen real estate and a kickstand, let’s find out. The Cube iWork 12 comes with very nice packaging. Inside the box you will find a tablet, a wall charger with a micro USB plug, an OTG adapter, a user manual and a warranty card. As we mentioned above, the iWork 12 has an identical design to the Cube i9, with a 12.2-inch display dominating its front and a 2-angle kickstand on its rear. The white bezel removes the feeling of cold black technology, and the Magnalium rear side gives the tablet a premium look. The left side plays host to a slew of ports and slots. You can find a Micro USB port, a Micro HDMI port, a 3.5mm headset jack, a Micro SD card and a full size USB 3.0 port. 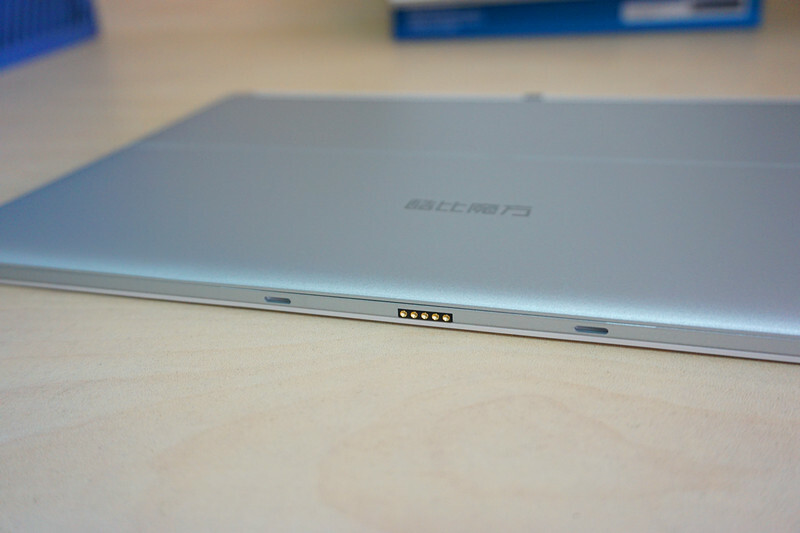 The keyboard port can be found on the bottom side of the tablet. As always, a power/standby key and a volume rocker on the top side. The built-in kickstand can open to two different angles, satisfying the needs of using the tablet in different occasions. Overall, this machine seems to belong in a class way above that of its price point, so kudos to Cube for continuing to provide compelling value in terms of construction. As the overall design remains quite similar to that of the i9, the weight and size are also nearly identical. The iWork 12 tips the scales at just 930g, although far from being the slimmest or lightest tablet out there, it is still quite portable by any definition. 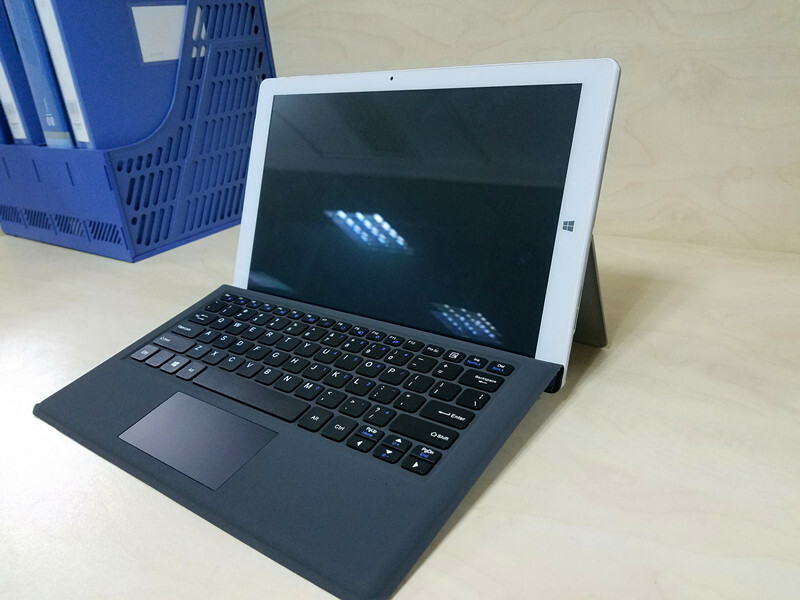 The keyboard cover for the Cube iWork 12 is exactly the one designed for the more premium Cube i9, and it matches the design of the Microsoft Surface Type Cover. 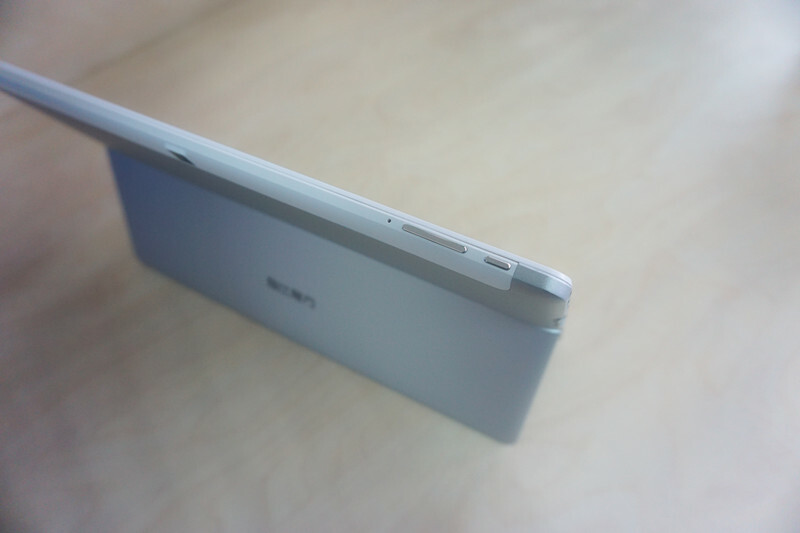 It is very thin, light, and won’t add much weight to the tablet. 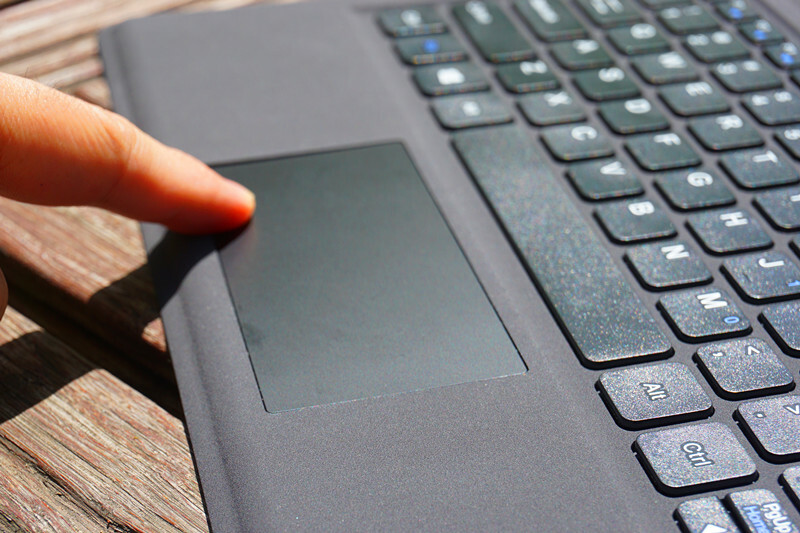 The tablet and the keyboard clip together quickly and easily, without much force or maneuvering. When in place, it’s a solid connection which seems like it could take some punishment without breaking apart. Like we mentioned in the review of the Cube i9, the keyboard itself is very well designed, with ideal space between different keys, it also offers decent key travel, which gives you tactile feedback when you type. 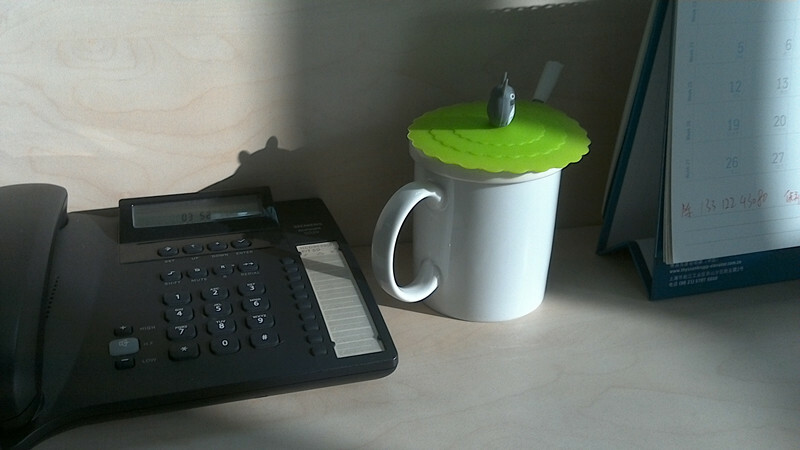 And we really love the ability to set it flat against the desk or at a more keyboard-like angle. We’d always rather use a full-sized laptop keyboard, but in the absence of that this Keyboard Cover is the very next best thing. The trackpad is reasonably sized, and it has distinct left and right click zones, and supports gesture control as you would expect. Unfortunately, unlike the Surface Type Cover, when you fold the keyboard cover around the back of the iWork 12 and the keys are still active. 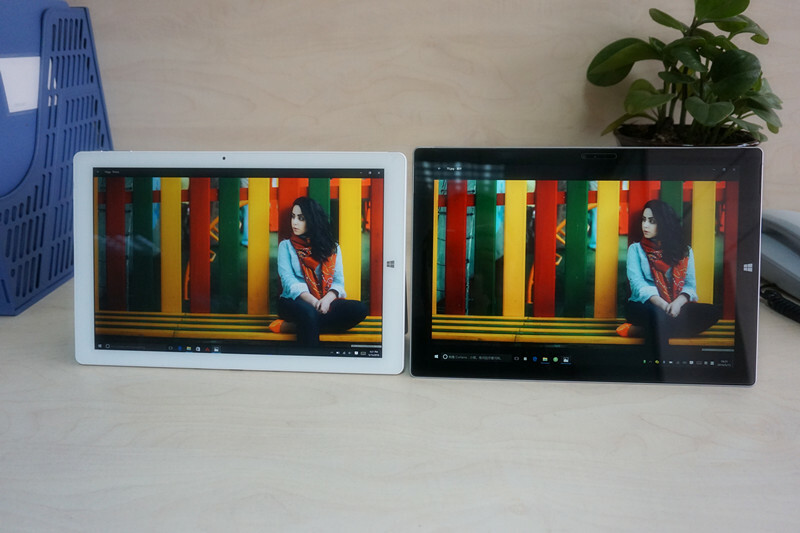 The Cube iWork 12 rocks a 12.2-inch IPS display at the resolution of 1920*1200. The display is bright, vibrant, with wide viewing angles. Even when compared to top offerings such as the Microsoft Surface Pro 3, the Cube iWork 12 doesn’t pale in comparison in the display department. And you can’t really tell the difference in pixel density from a normal using distance. With that said, I did notice more reflection when compared to top Android tablets such as the Samsung Galaxy Tab Pro 8.4, using it outdoors should be challenging. 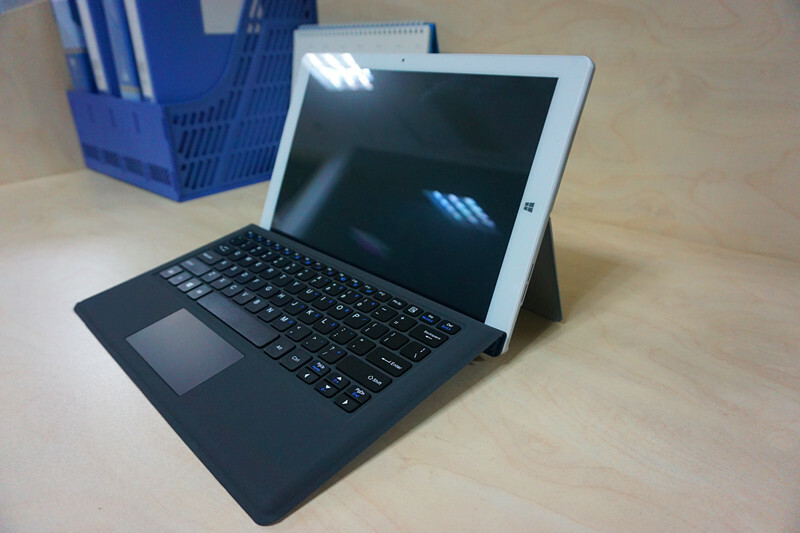 The Cube iWork 12 has stereo speakers, placed on the left and right side of the tablet’s chassis. Sound quality is respectable for a budget tablet, but not truly remarkable. It’s not too harsh or tinny, and having stereo sound is great for watching movies. Top volume is decent, but lacks the low-end bulk and power of the best tablet speakers such as the ones on the iPads and Galaxy tablets. The 3.5mm audio jack has no problem driving our high-end headphones to an ear-splitting level, and we could hear a lot of details through the headsets. You might have already noticed that I used a plurality in the heading, that’s because the iWork 12 ships with two operating systems in one machine: Windows 10 and Android 5.1, and you can switch between those two systems with only one or two taps on the touchscreen. Unlike the iWork 11 Stylus, which runs the 32-bit version of Windows 10 and can only use 3GB of the 4GB RAM, the iWork 12 is preinstalled with the 64-bit version of Windows 10 Home and can take full advantage of every bit of the 4GB RAM built in the device. 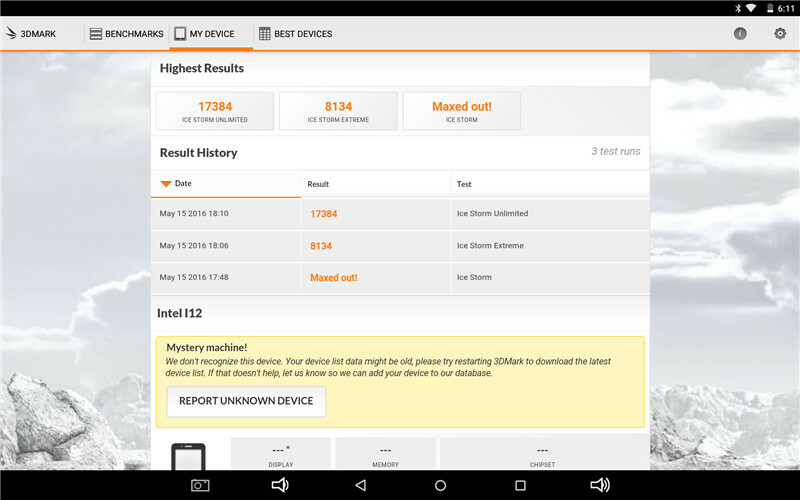 Both the Android 5.1 and the Windows 10 are clean, with almost no third-party applications. While the Windows side takes care of the everyday business tasks, the Android side takes care of your social networking and media consumption. With access to numerous applications in Windows (those in Windows store and traditional desktop apps) and Google Play, the iWork 12 is much more versatile than any your average Android tablets or iPads. The iWork 12 comes with a 64GB eMMc drive. Although not as lovely as the SSD used in higher-end tablets such as Cube’s very own i7 and i9, it is expected as an eMMc drive is always a standard choice for Atom-based tablets and netbooks. As the iWork 12 is running on both Android and Windows 10, the two operating systems takes up different partitions of the hard drive and don’t have shared internal storage. 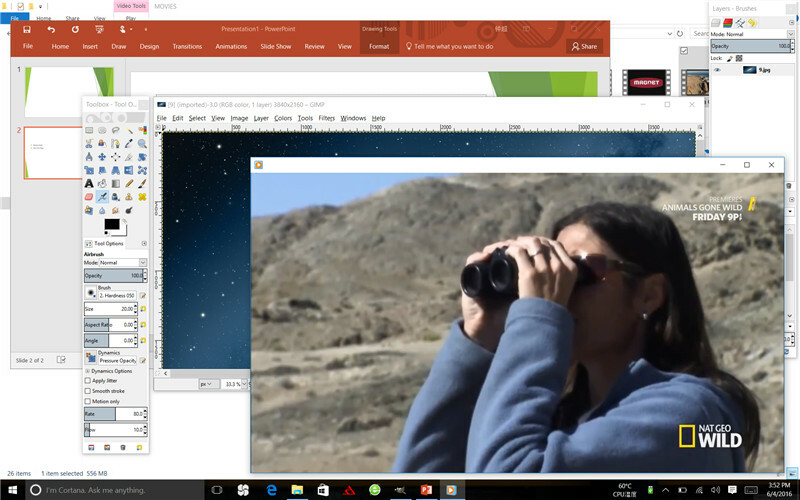 The Android side takes up a partition of 16GB, while the more complex and powerful Windows 10 takes up 48GB. Fortunately, the iWork 12’s storage is expandable by a Micro SD card up to 128GB. 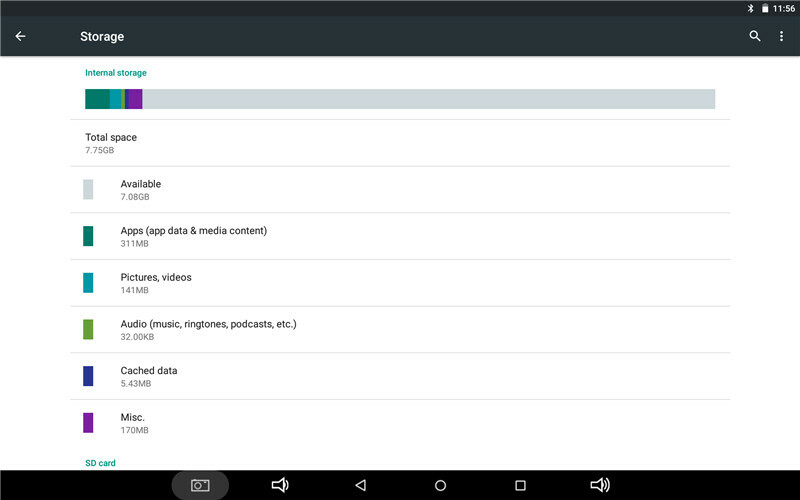 The users can save multi-media files in the external storage, which they can visit from both Android and Windows. The iWork 12 is powered by the latest Atom Cherry Trail X5-Z8300 processor and 4GB of RAM (DDR3 1066), and the performance is pretty predictable for an Atom-based system. On the Android side, the iWork 12 was pretty fast and responsive to all our controls. 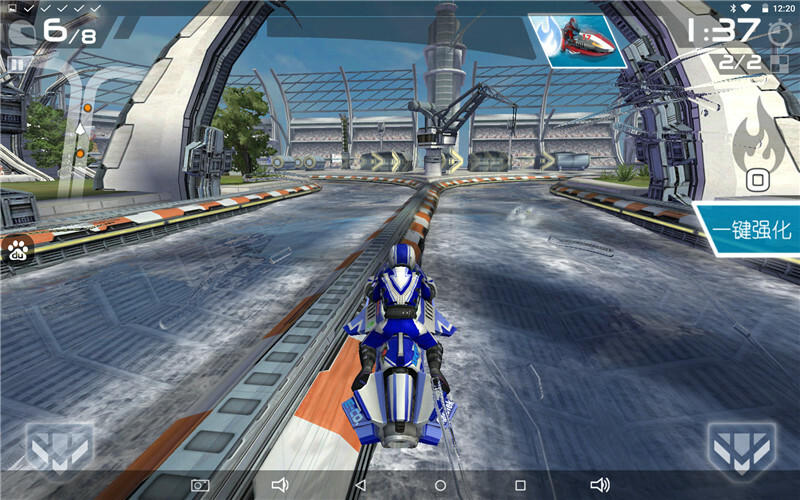 Tasks from scrolling the home screens to running graphic-intense 3D games are all handled smoothly by the tablet. We experienced very few lags or delays while browsing image-heavy webpages, watching YouTube Videos, social networking and gaming. 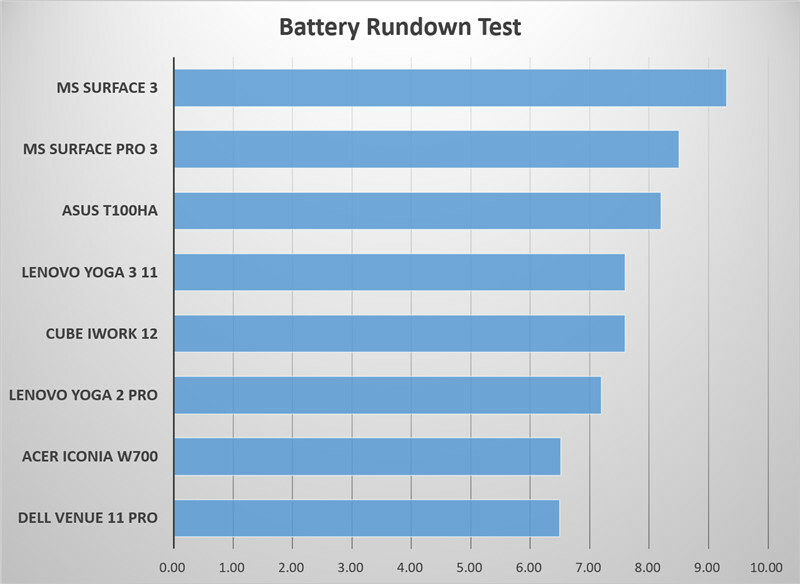 We also ran some benchmarks on the Cube iWork 12. 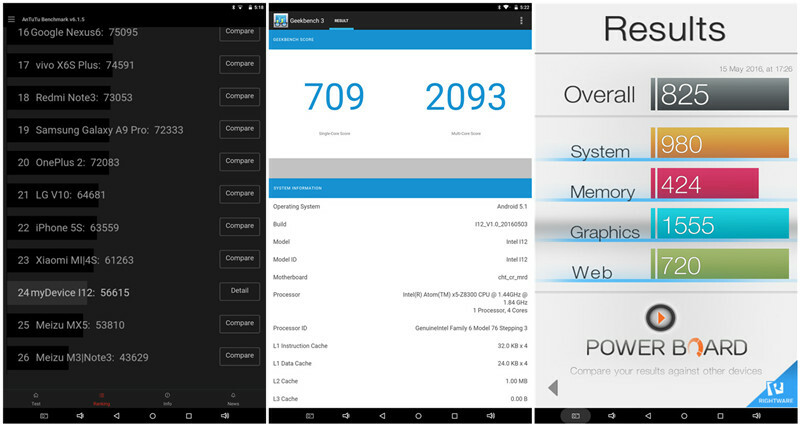 In the Antutu 6 benchmark, the slate was returned a score of 56615, and in the Geekbench 3 test, it got a score of 2093 (Multi-core). It is clear that the iWork 12’s doesn’t match the latest top Android smartphones in terms of benchmark scores, but I didn’t really feel it was by any means slow, even comparing it to my Samsung Galaxy S7 Edge. On the Windows side, things were a little different. Lags and stutters were non-existent running applications installed from the Windows store, and you can even use several Microsoft Office applications side by side, but the tablet still struggled with heavier desktop tasks: Unzipping a compressed folder took forever, Photoshop took a long time to open, and heavy duty applications such as Corel Draw and lightroom simply wouldn’t start. 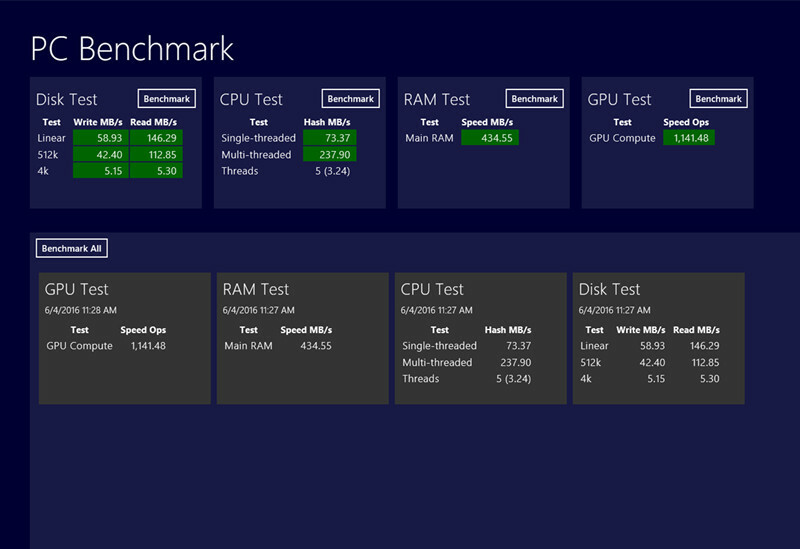 Benchmarks tell the story, too. 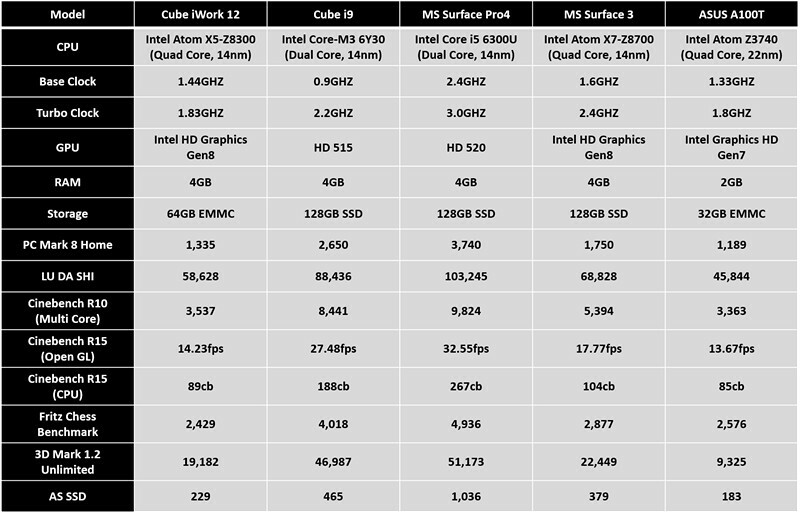 In most of the benchmarks, the Cube iWork 12 scored way behind the Core M powered Cube i9 and the Z8700 powered Microsoft Surface 3. In fact it barely surpassed the ASUS T100, which contained the older Atom Bay-trail Z3740 processor. The iWork 12 isn’t cut out to be a powerhouse tablet and can’t really replace your desktop PC or laptop for productivity tasks, it is more of a system designed for media consumption, social networking and light business duties. 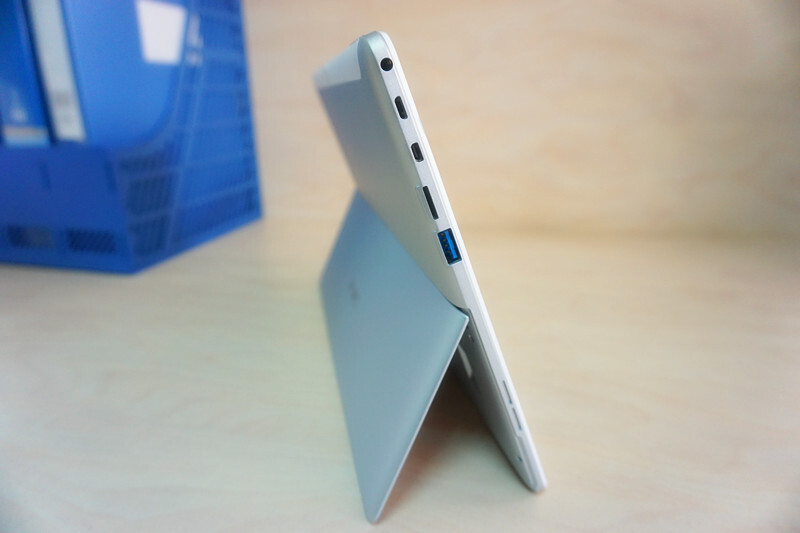 A slew of ports and slots, as well as built-in Bluetooth and Wi-Fi give the tablet lots of connectivity options. Not only can the micro USB port used for charging, it can also be turned into a full USB 2.0 port by the stock OTG adapter to host all kinds of input and storage devices. 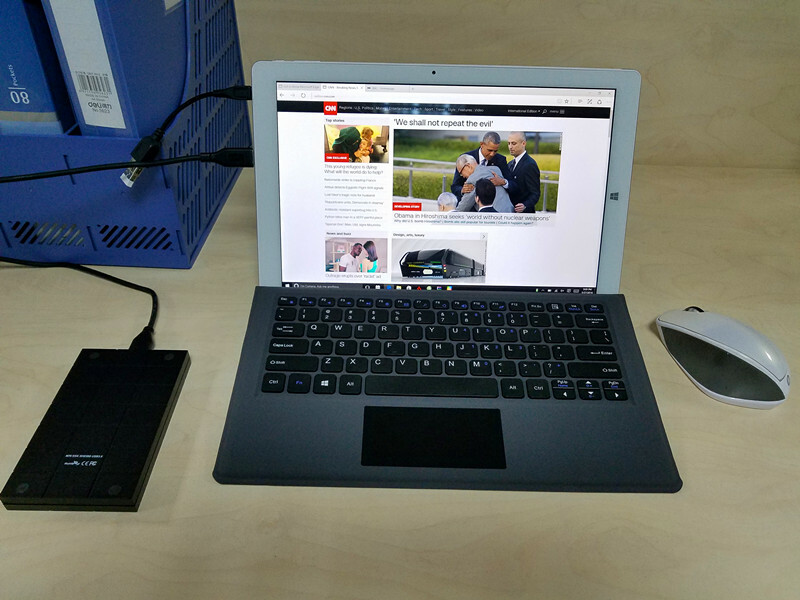 The full USB 3.0 port can take care of high-speed data transfer between your tablet and a mobile drive, it can also charge your smartphone pretty quickly. The micro HDMI port means you can connect your tablet to a monitor or an HDTV, and Bluetooth 4.0 means you can establish wireless connections with headphones, external speakers, and input devices. 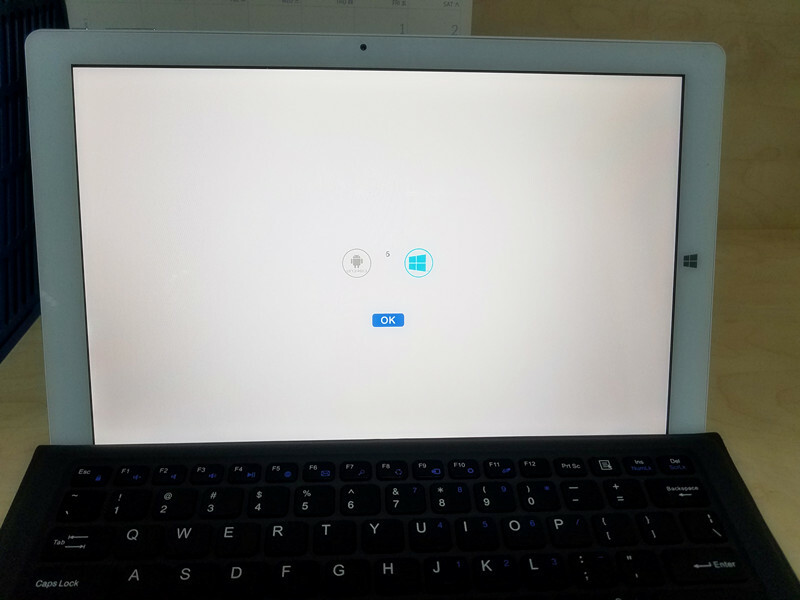 The iWork 12’s Wi-Fi connection is pretty solid, we could still stream online videos while there are a few meters and two walls between the tablet and the router. 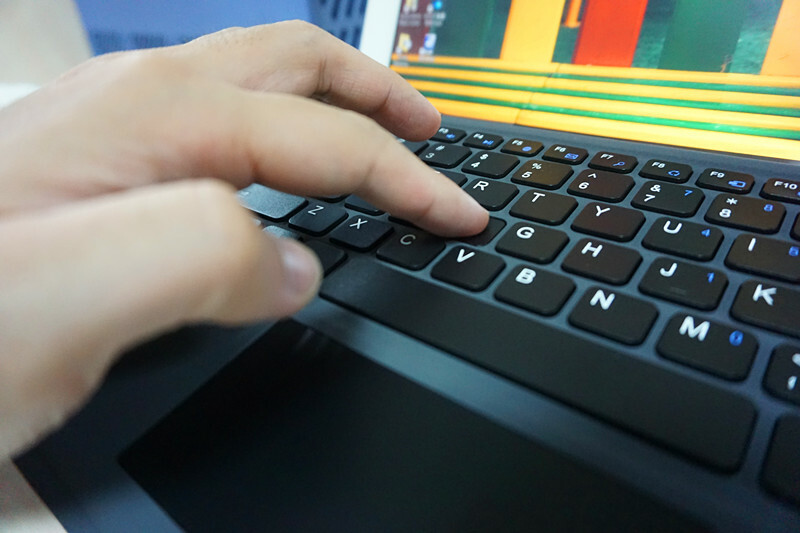 Unlike many other hybrids such as the ASUS T100A and Dell Venue 11 Pro, the Cube iWork 12’s keyboard doesn’t have its own battery to boost the tablet’s stamina. All charging is done using the microUSB port on the tablet part, meaning you don’t have to worry about losing a specific charge cable. Cube claims that the Iwork 12’s 9,000mAh Li-Po battery should last for 8 hours, but we normally only got around 7 hours’ screen time doing different things with the tablet. In our standard battery rundown test, where we played a 720P video (MP4) on loop, we got 7 hours and 35 minutes’ battery life from the slate. While the battery life of the tablet is still decent for a convertible this size, charging it can be extremely annoying. Sometimes the tablet would boot itself when we plugged in the charger, and the charging is also extremely slow. We normally needed around 6 hours to finish a full charge, and sometimes the charging got stuck at 99% for a whole hour…. The iWork 12 has two cameras, a 2MP front-facing camera and a 5MP rear-facing cameras. The front camera is decent enough for video-chatting, but we would not suggest using it for selfie. Useless for most people, the rear camera is just there for the sake of being there, the photos it took were of extremely poor quality, and you don’t really want to use a big and heavy tablet like this to capture your daily moments, while any smartphone could do a much better job. So who might we recommend this device to? Definitely not those who want a device to use as a main PC, but someone who already owns a powerful desktop PC and only wants a cheap netbook/tablet for light business tasks and media consumption. The best thing about the Cube iWork 12 is its cost-efficiency. For only RMB1,599 ($244, keyboard excluded), you have a versatile, simple convertible with a stunning 12.2-inch IPS screen. The tablet does media-consumption tasks brilliantly, and can handle reasonable productivity tasks as well as most entry-level laptops. 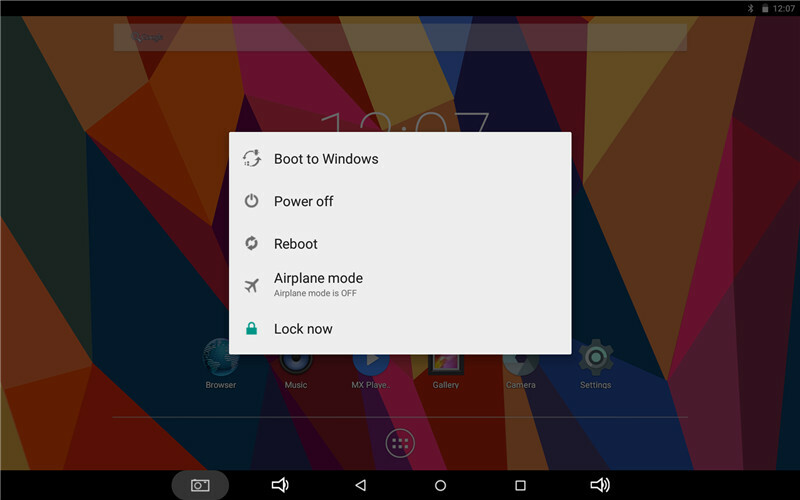 And you can easily switch from Windows to Android and the other way around on one device. 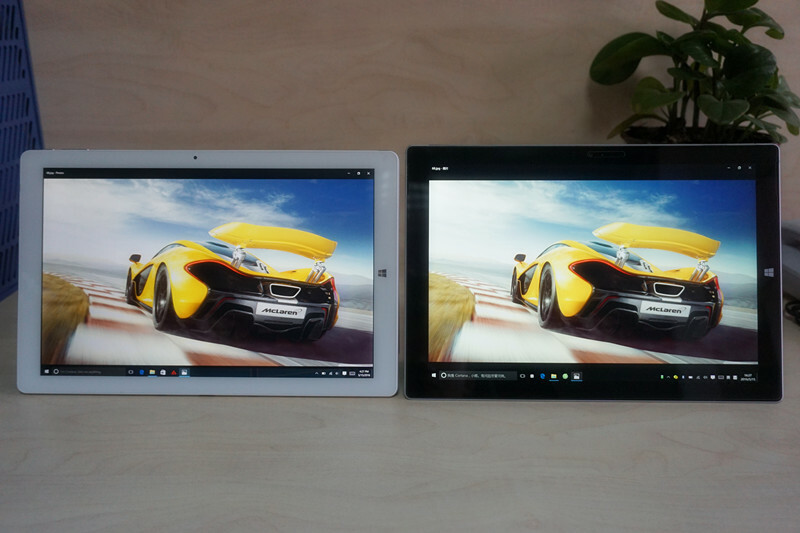 Also, the build quality of the Cube iWork 12 is superior to the similarly priced ONDA and Teclast tablets. There was plenty to be annoyed about with the Cube iWork 12. This is fundamentally not a powerful laptop, and only a passable tablet – especially when there are alternatives for which you could pay much less money and get the same level of performance. The excruciatingly slow charging speed and only average battery life mean this slate is going to spend a lot of every single day plugged into walls. Both the DDR3 RAM and the eMMC are pretty slow on this device, and that’s very noticeable while the tablet’s thrown with traditional Windows desktop tasks. The Cube iWork 12 is more of a system to replace your iPads or Android tablets than to use as a main personal computer. The ability to run Microsoft Office and other light desktop applications means you will always get more productivity out of this device than from an iPad or an Android tablet. For the right reason this can be a really good purchase, but since the iWork 12 is not the only dual boot tablet out there, you might want to take a look at other options before digging into your pocket. Hi, this item works with stylus pen? It works with a wacom stylus or similar?